After some time organizing and planning our trip we were finally ready to head south. We planned our trip over about 4 weeks through the European Countries of Austria, Italy, France, Spain and Switzerland. Unfortunately we are not on vacation and won’t have a lot of time to really enjoy our travel destinations, since our working schedule is full to the top. The main targets will be: scouting for a large American travel wholesaler, location scouting for a movie production as well as photography and writing for several travel guides and hickerphoto.com. Although our aims are clearly defined, we hope that we also find time to write for our travel location blog. Our small car is packed to the max with maps, information, photo equipment and.., yes, we brought some clothing too (Michelle insisted on it), but we hope and depend on laundry places as we go. Today’s destination will be Bruneck (otherwise known as Brunico in Italian) in South Tirol, a well known location for skiing fanatics and mountain hikers. We decide to leave Freising in Bavaria, go through Munich and south towards the Bavarian Alps and via Mittenwald into Austria. 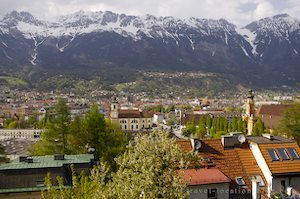 Passing through Innsbruck in Tirol on the way to the old Brenner Road, a beautiful road which winds up and over the Mountains. At the old Brenner customs station we arrive in Italy, this Northern Part of Italy is also called South Tirol. As many of you may know, there is no border patrol anymore between many of the European countries. Overlooking the city of Innsbruck from Berg Isel, Tirol, Austria, Europe.